I grew up in Papua New Guinea, where I was fortunate to have been able to keep many exotic indigenous pets. And so I came to love animals. But I must confess this: I somehow developed an attitude that farm animals, such as rabbits and chickens, were not as special or important as say, a Harpy eagle, a tree kangaroo, an Eclectus parrot, or a cassowary. More about that to come! In that process of sensitizing yourself to non-humans and placing no barriers between yourself and them, you have to go beyond your previous mind about non-humans as sort of non-beings. And so, with my love of animals, it seemed natural to find myself at one point the zookeeper of Fear-No-More Zoo! One of the creatures being kept in the zoo at that time was the giant French lop-eared rabbit. The zoo housed a number of them, and the grand dame of the group was a very large ginger-red rabbit named "Strawberry Tea." Back then I knew very little about Adi Da Samraj's teaching about non-humans, and had much to learn. Because of the prejudices and preferences developed from my background with exotic species, it took me a long time to come to the point of accepting the rabbits as no less important than the beautiful Bactrian camel also at the zoo. I found I had very little interest in the rabbits. And I could not fathom why my spiritual master liked them! For a good long while, I toyed with various proposals to sell them, until one day I finally decided I just had to get beyond my resistance to them. I knew I needed to do this for their sake and for mine. And so I completely rebuilt their enclosure, making it much more interesting for them, a much happier place from top to bottom. And for a while after that, I really did feel a connection to them. But over a few months I noticed that my old ways of looking at them were returning. I was extremely frustrated. 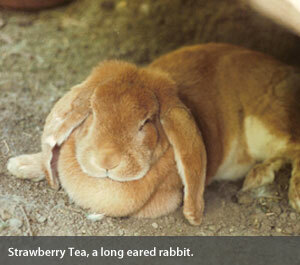 One day, Strawberry Tea fell ill. She was an old rabbit who had many litters in her time. She was developing a tumor on her side, which would eventually end her life. During the long haul with her, in her last weeks and days, two things were going on for me. I was still facing up my resistance to rabbits, and still not really acknowledging them as I knew I should. And, curiously enough, I was simultaneously falling in love with Strawberry Tea. The day came when I knew it would be her last. I could sense it from her. As I bathed her that day, to remove the urine and feces from her golden fur, almost all of my resistance dissolved. I was bent over her on the lawn, gently washing her face and body and paws. I remembered Adi Da's deep intimacy with non-humans, his love and embrace of them all. She lay there on the towel, relaxed, breathing deeply, trusting. Her eyes were open. My heart melted. Not just because she was dying, but because I suddenly felt her not anymore as a mere rabbit, but as an actual person. She had become more like an old woman to me now, in a sense no different than my own grandmother. And I clearly saw that she was no more, and no less, deserving of love than I, or anyone else. I felt so close to her at one point that afternoon that there was no difference, no separation between us. That we each were of the same Being was irrefutable to me now. As I gently put Strawberry Tea in her hutch for the evening I knew this would be the last time I would see her alive. Looking at her limp, wasting body, I wept because she was dying, and because I now loved her, and I was greatly relieved. And then, the very next morning, I awoke only to discover with a shock that my feeling of resistance to rabbits had returned. I couldn't believe it! In my sleep, I again had withdrawn from them emotionally. I felt ridiculous that I was even going through all this emotional struggle around some rabbits. Before I headed down to the zoo to begin my day and check on Strawberry Tea, I noticed an envelope addressed to me, from a friend who knew nothing of what I was going through. As I opened it I was still in the midst of my "ordeal with rabbits." I asked out loud, "Why does Adi Da even like rabbits? What does he see in them?" As I finished this frustrated plea for help of some kind, I pulled out the contents of the envelope. It was a small color photograph of Adi Da Samraj in the early 1970's. He was bending forward toward — of all things — a cute black and white rabbit, his arm stretched out toward it, with a bright orange carrot in his hand. A big grin beamed from his face. In that split second, at the height of my crisis around this issue, my spiritual master mysteriously showed me that he liked rabbits. He LIKED them! It was as simple as that. Somehow that was now enough for me. I could like them too! From that day on, I have experienced no similar problem with rabbits, or any other animal. On that day, and ever since, it became obvious to me that all beings are equally important. They are beings, not things. I'd always mentally thought this way, but now I could really feel it and understand it as well. I am in conversation with all beings and things. It is not that only human beings are full of 'soul' and everything else should be chopped up and eaten for lunch! If you examine beings other than the human, feel them, are sensitive to them, enter directly into relationship with them, you discover that they are the same — and not just the somewhat bigger ones, like my parrots, but the mosquitoes, too, which you swat out as if they were nothing. At heart, human beings are manifesting a potential that is in all and that is inherent in conditional existence itself. Whether this potential is exhibited or not, whether it is made human or not, makes no difference whatsoever to the divine self-condition. All is one. All are the same. All equally require divine compassion, love, and blessing, the thread of communion with the divine made certain and true and directly experienced. All. Therefore, the sphere of my work is all beings and things. Literally it is so. This is literally how I work. 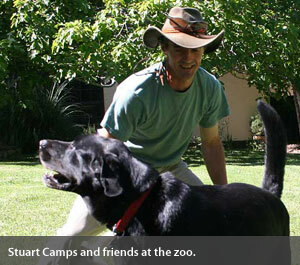 For more information about the zoo visit http://www.fearnomorezoo.org.